SCP-2373 in its dormant state. Special Containment Procedures: SCP-2373 is currently contained within a Class-A containment chamber at Site-19, separated from Hallway 284 by an airlock. The doors leading into the chamber are only to be opened consecutively upon entry. No fewer than two non-D-Class personnel are to enter SCP-2373's containment chamber. D-Class personnel are to enter the containment chamber alone. Description: SCP-2373 resembles an emaciated, hirsute humanoid. Its skin is covered in black, furry bristles, though, as its lower body appears to have been severed at the abdomen, it is impossible to determine whether these bristles extended beyond the torso. SCP-2373's eyes remain constantly open. 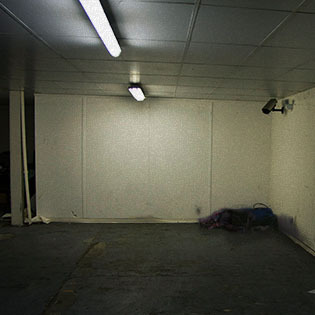 If no human subject is present within SCP-2373's direct line of sight, it remains in a dormant state on the floor of its containment chamber. If a single human subject comes within SCP-2373's direct line of sight, SCP-2373 will begin to animate, telekinetically repositioning itself directly behind the subject. This initial movement is fast; subjects do not acknowledge SCP-2373's presence as it enters its active state, as the speed of its movements upon animation surpass human visual perception of motion. SCP-2373 will remain suspended behind the subject's back, remaining limp and occasionally shuddering. SCP-2373 will follow the subject, altering the position of its forelimbs and swiftly acting in accordance with the subject's movements, ensuring complete unawareness of its presence. This effect continues until SCP-2373 is outwardly observed by a third party, attacked, or obstructed by a solid, where it will relocate to an environment in which one or no human individuals are present. If this is not possible, SCP-2373 will re-enter its dormant state, facing against the nearest wall, away from all human individuals. SCP-2373 casts no shadow, bears no reflection, and is incapable of emitting sound upon physical contact with external surfaces beyond 4db. SCP-2373's movements in its active state can only be observed electronically, through transparent solids, or by non-human individuals. Occasionally, while in its active state, SCP-2373 has been known to flinch, momentarily clutching its amputated abdomen in pain. The source of the amputation is unknown, but its cut is consistent with that inflicted by a rotary blade or bandsaw. Centred about the amputation on the dermis is a faint, incorporeal transparency, similar to that exhibited by previously-contained spectral, invisible and/or intangible entities. Current hypotheses suggest that SCP-2373 is/was a Type 4G1 Phantasmic Entity, which somehow underwent partial re-embodiment, impeding its ability to control its outward form. 1. "Type 4G: Any spectral entity possessing the ability to visibly and/or physically manifest and demanifest at will." See Document: OO8REF, Captain N. Barratt's Disquisition Guide to Paranormal Activity, for a full list of Phantasmic Entity classes.